OVERALL: HOLY BLESSED AND CHEERING UNIVERSE THIS MOVIE IS FANTASTIC!!!!!!!!!! BEST!!!! I walked out of this movie and wanted to walk right back into it again. It was amazingly good. I want to see it again. Now. POINTS: OMG the whole movie was a good point!! I said to my Hubby as we walked to the car after the movie that “Zero Dark Thirty” was another example of the director letting the actors do all of the work. Or rather, let it look like they are. The actors get to act in this movie. They get to carry it by letting their characters show all of their pain and growth and victories. What was also moving was how long and tedious real spy work is. It involves following people over and over again; listening to interviews and reading transcripts over and over again; fighting to get tech support; and finally getting the approval of your bosses. It is a lot like regular work except for the being shot at and getting added to someone’s “list” for killing. 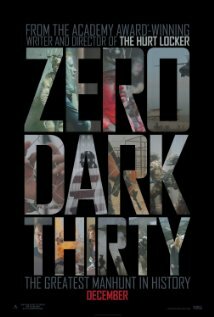 Note: I wondered about the title and discovered: “Zero Dark Thirty (the title is military slang for 12.30am, the time of the Navy Seals raid that uncovered bin Laden in May 2011).” – From The Telegraph. FEMALE CHARACTER(S): Maya. Oh Maya, we love you. Maya is the heroine of our story and we follow her through her long search for Usama bin Laden (UBL). Jessica Chastain cheered on the character as an example of the new young women in the work world. YAY! Maya never gave up and never stopped and she is the driving force behind finding UBL. She had great lines, great scenes, and is just GREAT! Go Maya! And then there is Jessica. Oh Jessica you are so cool. I loved the collegial friendship between the two women and how Jessica becomes a driving force for Maya. CULTURAL PITFALL(S): Ok, let’s talk about the torture scenes, though these were not pitfalls in the movie but low moment in US history. The scenes were very necessary and real and, unfortunately, torture was part of how we went after UBL. What was nice was that the way he was finally found was through the use of non-torture methods. 🙂 They needed to be there, they need to stay, and no the filmmakers should not apologize for them. We should apologize for the real torture chambers. HIGH POINT(S): Wow. Ok here’s the current list: [SPOILER ALERTS] 1. When our heroine realizes in the last scene of the movie that her work for over ten years is finally done and she begins to cry. Breathtaking! 2. The whole raid on the bin Laden compound had me on the edge of my chair. 3. “I’m the m*ther f*cker who found him.” – Maya. OMG a woman said that – hallelujah!! 4. “You’re going to kill him for me.” – Maya to Seal Team Six. 5. The verbal face slap at those who convinced the US to go to war over the WMDs. 6. Maya identifying UBL’s body. 7. The touching a tragic sound of the real recordings of the people during 9/11 who knew they were dying and the first responders. Bless them all. DVD/BLU-RAY WORTHY: Holy goodness YES!!! Full package, I’ll carry this movie with me on my iPod. I need to see it again. LION PAW PRINTS: 5 of 5. So amazingly good.